Citation: C N Trueman "Battle of Gazala"
The war in the desert had been ongoing since June 1940 with neither side able to deliver a knockout blow. The terrain made a cohesive strategy nearly impossible as a victory was difficult to follow up. The sheer distance between each side’s headquarters in North Africa – 1,300 miles – gives some indication that communication was also a major issue. A campaign in the desert tended to go in fits and starts. The Afrika Korps was a poor cousin to the forces being readied for Operation Barbarossa in terms of the equipment they were given. Rommel had a constant battle getting OKW to supply him with enough fuel and modern equipment despite his apparent success there. 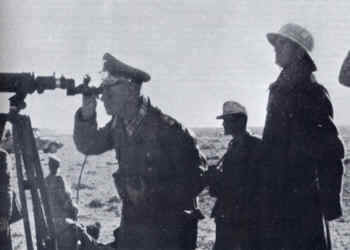 In late-January 1942, Rommel had re-captured western Cyrenaica and had advanced his two divisions to within 26 miles of Gazala and 64 miles from Tobruk. The came a lull in fighting during which both sides reorganised their men and equipment. Little took place between late January and late May. Rommel’s attack on Gazala came at an interesting time during the war. To all intents the Axis forces were doing well in mid-1942. Most of Europe was under Axis control, the Germans seemed to have recovered from their failure to capture Moscow and were developing their forces for a massive attack on Stalingrad. In the Far East, British and Indian forces were in retreat in Burma while the Japanese were consolidating their power in the huge region they had conquered.